Jiazazhi Press, Ningbo, China, 2016. 64 pp., color illustrations, 6¾x6x2½". View the second, revised and expanded edition. 3DPRK is a collaborative project between Slovenian photographer Matjaž Tancic and Beijing-based North Korean art specialists Koryo Studio in 2014. The resulting series of portraits is the first time that local people from across the country have been photographed using a 3D stereoscopic technique. This landmark collection shows not only the relatively oft-photographed citizens of Pyongyang – North Korea’s showcase capital – but also those toiling in the fields of the co- operative farms, those living in Hamhung (North Korea’s second largest city) and those working in factories and steelworks across the country. Tancic used 3D technique, that requires patience and understanding on the part of the subject – standing motionless for minutes while 2 photographs are captured to cover the requisite perspectives. In a country where people are understandably wary of the Western-wielded camera, and the guides – acting as facilitators, translators and assistants – are not naturally disposed to prolong the process of taking photographs in public spaces, this is no small task. As with all portraits, these photographs depict living human beings, upon whose gaze you may project what you will. Each protagonist agreed to be photographed and was well aware that their image would be exhibited to a wider world. Perhaps it is the individual that shines out from these photographs; each portrait has its own distinct personality, ranging from disdain to pride. It is the uniqueness and beauty of the 3D technique used for each photograph that ultimately highlights the individual nature of the people posing for each shot, and the various layers that make up the surreal theatrical set that is the DPRK today. 3DPRK is printed in an edition of 1,000 signed copies. 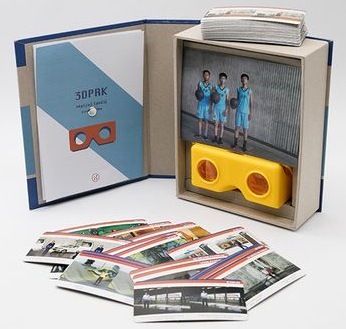 Contains 3D glasses, 64 3D stereoscopic cards, 5 3D lenticular postcards and an introduction booklet inside.